The Singular WOD Lacrosse Ball helps to massage contracted muscles areas and treat hard-to-reach trigger points. 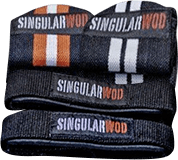 The Singular WOD Lacrosse Ball is ideal for after training or on your rest day. This small rubber ball helps to put pressure on contracted muscle areas, massage muscle knots and treat hard-to-reach trigger points. You can use the Lacrosse Ball on your trapezes, dorsal and deltoids after an upper body workout or your glutes and calves after a long run. Massage or myofascial self-release is recommended for all types of athletes, from beginners to professionals, and to improve movement for people with reduced mobility. Foam Roller for self-massage or myofascial that improves blood flow around the body and flexibility of tissues. Essential for keeping up a demanding daily workout. Recommended for use in warming up, before workouts or just afterwards, to increase blood flow and loosen your muscles.